My first week working at Scape Interiors Bournemouth has been both interesting and fun. Everyone here has made a great effort in making me feel welcome and helping me to get settled. Like any job though, the first week is always the toughest. And working at Scape is no exception – I have had a lot to learn! The properties of the wood used for the wood furniture, for example. Before this week, I had never heard of Dark Mango wood furniture or Sheesham wood furniture (the latter also known as Indian Rosewood furniture). But thanks to my friendly and supportive colleagues, I’m now learning all about the qualities of Mango wood and Sheesham wood, how they should be treated, cared for, and how they are sustainably sourced. 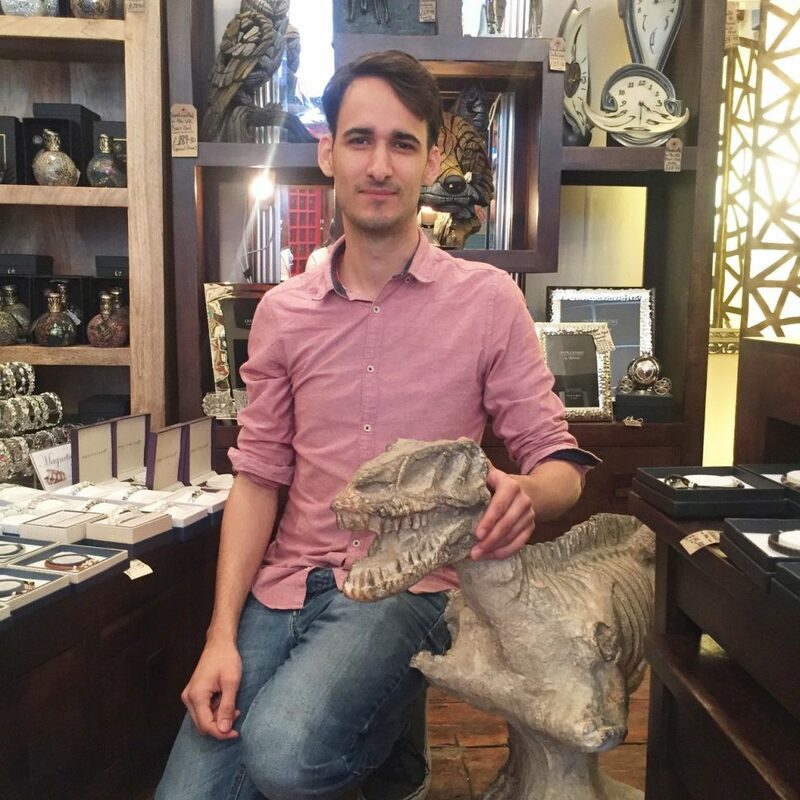 As the newest member of the team, one of my first tasks was to explore and get accustomed to the different themes of the two shops – which I can only describe as two wooden wonderlands filled with different trinkets from around the world. The first shop is more of a rustic and metallic looking place, filled with a range of curious artefacts, which gave me the sense of having just stepped into one of the magic shops from Harry Potter’s Diagon Alley. Here there is a fossilised T-rex statute (which I’ve named ‘Rex’ – original, I know), hand painted animal bust sculptures, Bromley compasses, and my favourite piece, a Raj style 1820’s turn-table, which really takes you back to another time. The other shop, however, reminds me of a cross between a summer house and the local flower shop I used to visit when I was a kid. This shop is filled with many beautiful gifts and artificial flowers (it took me a while to realise the flowers were fake – no judgement please, they are very realistic looking). Between the two shops, I definitely don’t feel like I’ll be at a loss of birthday present ideas, or anniversary present ideas, ever again. A pivotal moment of my first week came from when two other junior colleagues came running from the other shop screaming that they had just seen a spider. By their frightened expressions, I knew it must be a large one. Not being entirely fearless of large spiders myself, I bravely followed my colleagues next door, where they pointed to the space to which they had seen it. However, I was having trouble seeing it. Was it invisible? Was it hiding and planning to jump out and attack me? “There! There!” my colleagues cried, yet I still could not see it. No wait… There it was, a deceased money spider hanging from a print frame. This couldn’t be the spider my two colleagues were so afraid of, could it? Surely there was a monster lurking nearby. I asked them whether this tiny arachnid was the spider causing them so much hassle and they nodded. A great feeling of relief surged over me – I was definitely not looking forward to coming face to face with a large garden spider! Needless to say, I was able to remove the tiny invader and save the day. So, as far as first weeks go, I feel like my first week at Scape has been a positive one – spider slayer or not!